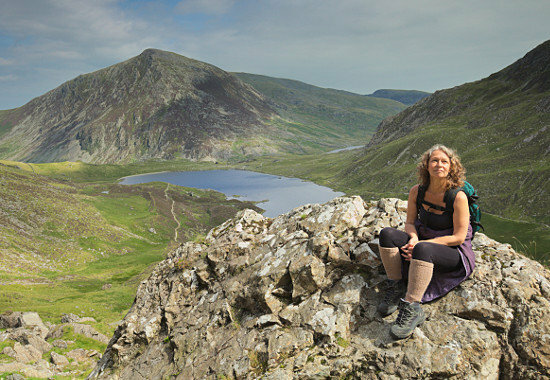 A walk around Llyn Idwal at nearly six months! Today, a mere five and a half months after my hip operation, Daf and I set off from the island (Anglesey) and took ourselves deep into Snowdonia for a little adventure. 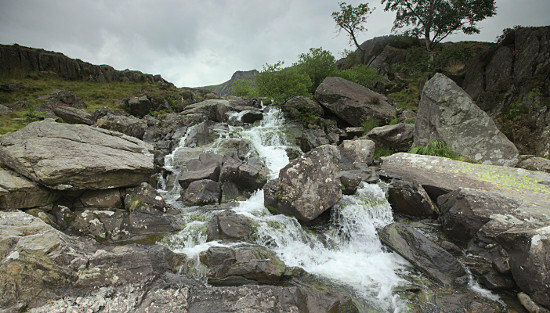 We parked by Ogwen Cottage and began walking up hill towards Llyn Idwal: the first stop, however was at the bridge over a beautiful waterfall a very short distance from the car park. I just love taking time to gaze at the water rushing between the rocks and under the wooden bridge. From there we carried on up the well maintained stone path until we got to the lake (llyn), where, once again, we paused to gaze at the brown tinted water. The route then takes you either clockwise or anticlockwise round the lake: we chose to go anticlockwise. The path began to climb again, at first gently, then fairly steeply, but my hip behaved really well and we made it round the upper path until we had a clear view of the lake and the surrounding hills. By this time the sun had burned through the clouds and the lake was reflecting blue. The descent back to the lake was slightly quicker, and we sat by the water watching a shoal of tiny fish darting about in the sun warmed water close to the shore: we’d seen a heron a couple of times earlier, but these little fish avoided being lunch for another day. The rest of the descent was straightforward and after another stop to watch the tumbling cascade of the waterfall, we set off for home. What a sense of achievement! I’m sure there’s a quilt in there somewhere! This entry was posted in Blog on 13 August, 2015 by admin.